Up to 54 people died as a result of an accident in the southern Brazilian state of Santa Catarina, in which a bus fell into a ravine from a height of 400 meters, local police said in a dramatic increase of the initial death toll. 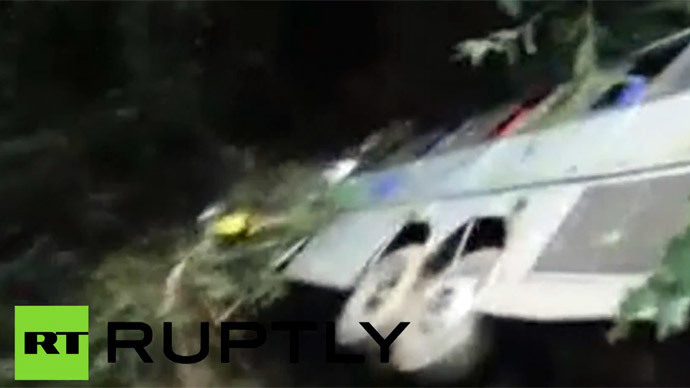 The bus fell down a cliff near the town of Campo Alegre when it was some 10 kilometers (six miles) away from its destination in the city of Joinville. It was bringing a group of evangelical Christians to a religious event in the neighboring state, Reuters reported. The toll was raised from 32 killed and 11 injured after emergency crews working at the scene discovered another 19 bodies. The total number of passengers was not immediately clear. The latest report says that at least six survivors, including two children, are being treated for injuries. Police said the brakes of the bus appeared to have failed at a turn in the road. Brazilian President Dilma Rousseff expressed her sympathy for the families and friends of the dead. Traffic accidents have recently surged in the South American nation, according to the data cited by AFP over the years 2002 to 2012, with about 43,000 Brazilians now killed in road accidents annually.